I slept very well. Neither NC nor I could remember even getting into our futons. I woke up at 8:00am to the phone ringing. The restaurant staff were letting us know that our breakfast was ready. I had asked reception for the latest possible time slot for brekkie. Half the day’s course consisted of gentle uphill stretches while the rest was to be downhill. We checked out at 10:00am then moved to a spot with benches and a table next to Kiso-fukushima Station to fix the puncture. I searched for evidence of a spiky thing in the tyre but couldn’t find anything other than a tiny mark where something had pierced it, so I simply replaced the inner tube and started to assemble the bikes. For the sake of my mental state, I asked NC to check the small “Cyclist Support Corner” under the eaves of the shop across the road to see if they had inner tubes for mountain bikes. While there are stores that sell parts for mama-chari (a generic term used to describe bikes commonly owned by housewives when they go shopping) shops that hold more specialized goods for high-end bikes are rare in the area. Since I had used our only spare inner-tube I was eager to have another on-hand in case we got another puncture. I knew that the Cyclist Support Corner sold supplies for cyclists, and assumed they specialized in road bikes. NC came back with a picture of the corner store on my mobile phone and it showed the store had the same brand and same type of inner tube we needed. After purchasing our new spare inner-tube and setting up the bikes, it was just after 10:30 am by the time we were prepared for the day’s ride. The name Kiso-fukushima originated from the original name of the post town, Fukushima. Kiso was added later to distinguish the region from others as there are many locations called Fukushima in Japan. 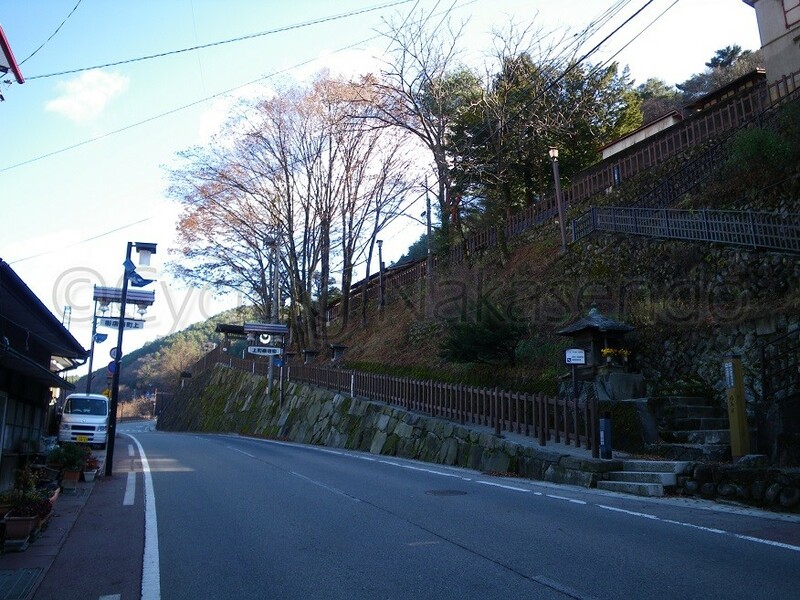 The road between the train station and Tsutaya actually traces Nakasendo, which begins with a short downhill two-lane community road. As it continues it passes local shops, banks, local inns and a soba noodle restaurant. 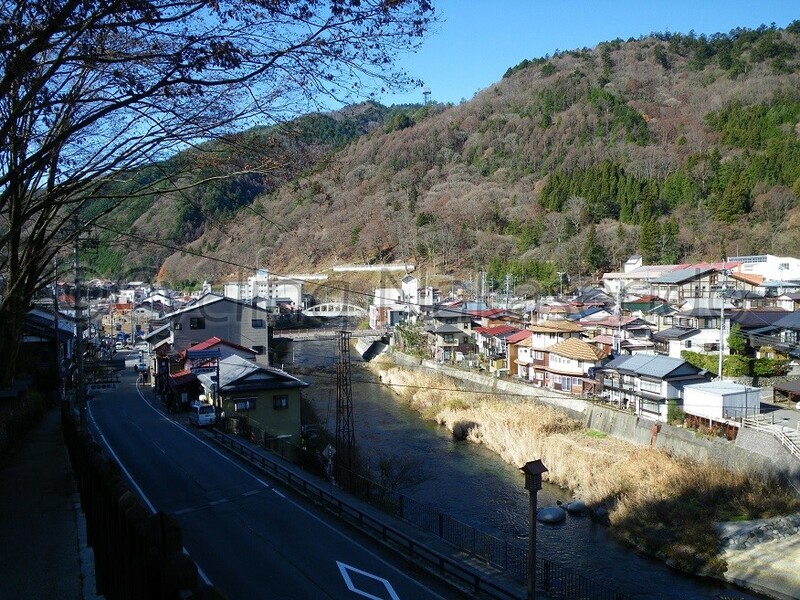 Nakasendo continues straight whereas the two-lane road diverts left towards Kiso River. We stayed on Nakasendo. 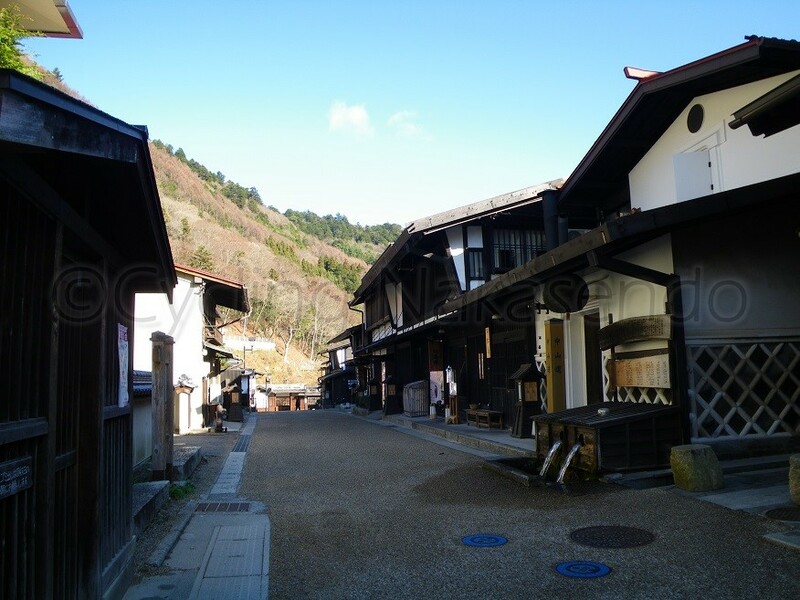 A bridge appeared on the left as we passed rows of Japanese style houses on either side of the narrow street. The street is paved in a yellowish sandy colour from the bridge and continues for several sections of road within consecutive masugatas. It is just 270 m in length, but has a charming atmosphere with very nicely restored old buildings lining the street. At the center of it is a paved stream where clear water has flowed continuously for more than 800 years. 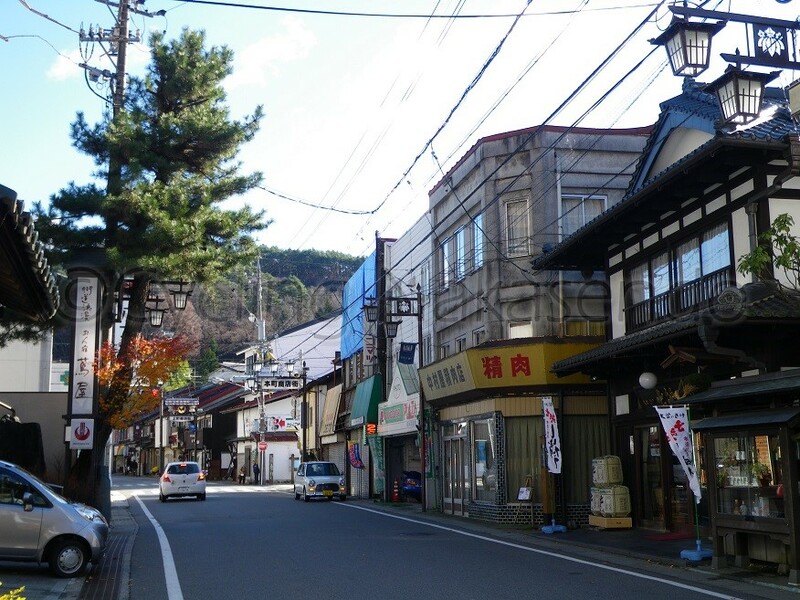 As we continued on Nakasendo the street became a downward slope where we made a right turn at the restored kosatsuba and from there the route veered to the left and leveled off as we passed a local sake brewery. We came to a narrow passage, which ended up joining the widened road after turning right. 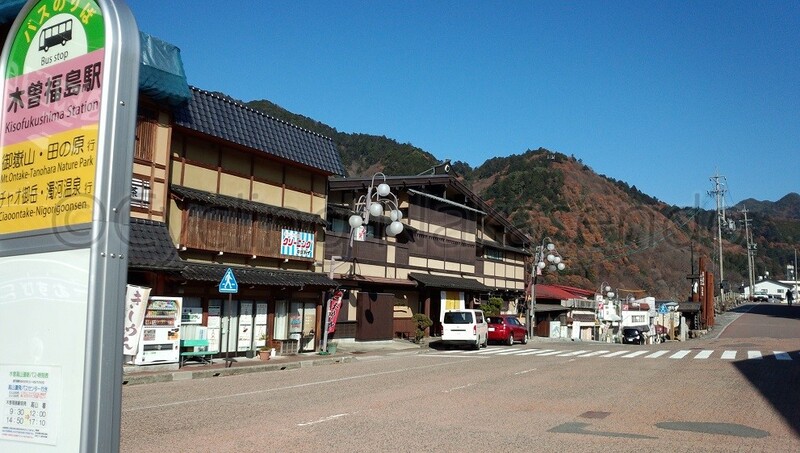 The street along the next section of Nakasendo looks like a regional Japanese town would have 30 years ago. At this point we came across a set of traffic lights, which seemed like the first ones we had seen in ages. There on the right was the honjin of this post town, which was destroyed and rebuilt as the town office, which is still functioning today. On the left, over Otebashi Bridge, is the former residence of the Yamamuras, a famous family in the area due to several of its members acting as the magistrate of Kiso region during the Edo period. 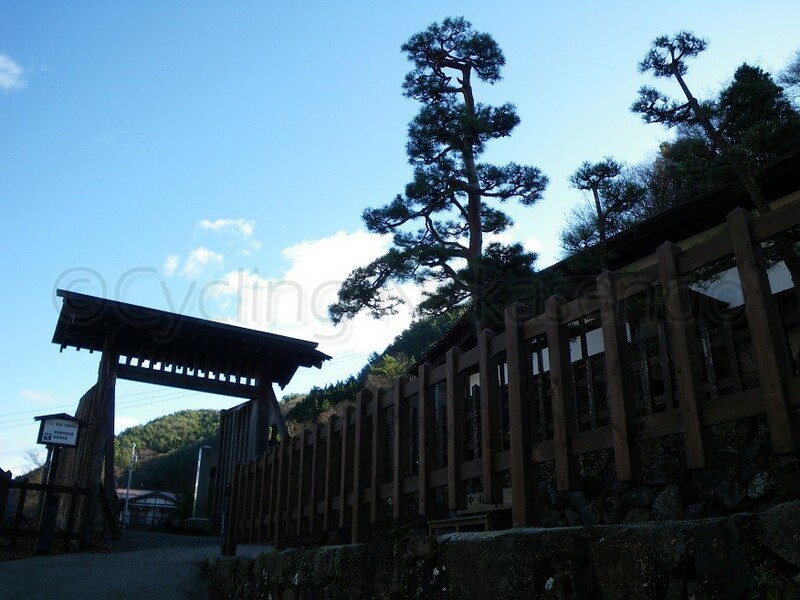 In front of us, on the top of a stone wall was the site of a sekisho (a security checkpoint). These usually consisted of a gateway and a building within which inspections were conducted. The landscape in this area was once characterized by steep valleys, however the land around this section of the route has been excavated to enable building new road on the river-side of the sekisho. The original sekisho no longer exists but a replica of the building that stood next to the gate has been built and is now a history museum about Fukushima’s sekisho. Travelers in the Edo period could only proceed after being subjected to very strict inspections at this sekisho in Fukushima. It was known as one of four large, strict sekisho in Japan. Including Fukushima’s sekisho (37th post town from Edo) there were two on Nakasendo, the other was in Usui (between the 16th and 17th post towns from Edo). These inspections were to check for illegal transport of firearms and of outbound females from Edo. Most of the women were wives or princesses of regional lords. Tokugawa feudal government ordered such women to live in Edo as hostages to deter regional lords from raising a rebellion against the regime. Outbound females were kept under strict surveillance and eyed with suspicion as they might be going back home because they were asked by their lord to prepare for a rebellion or because they might be carrying important and secret information obtained in Edo. Basically all travelers had to present a special pass when they came to a sekisho. 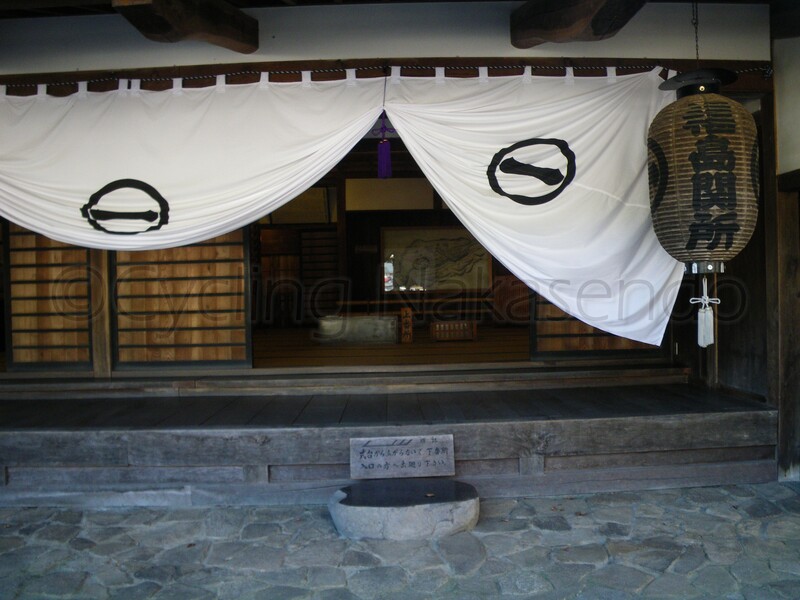 People from the samurai class applied at the domicile headquarters and the general populace applied through making requests to town officers, village headmen or priests at local temples. This pass contained the applicant’s name, background, domicile, itinerary, purpose of journey and distinctive facial features. In the case of female travelers a description of their hairstyle (representative of class) was also added. In addition to this information an affixed seal of authority of issuance was needed to pass through the sekisho. Inspection officers at the sekisho checked for consistency with the document (pass). First they would verify the authenticity of the seal by referring to a set of seal imprints. Any suspicious person or luggage was subject to an intense inspection, such as a strip search and a complete luggage inspection. These were carried out by special officers just like passport control and customs today. Female officers were also employed for this particular purpose for female examinees. Generally the duration of a series of inspections was two hours after which the traveler would finally be allowed to pass the imposing defense gate. 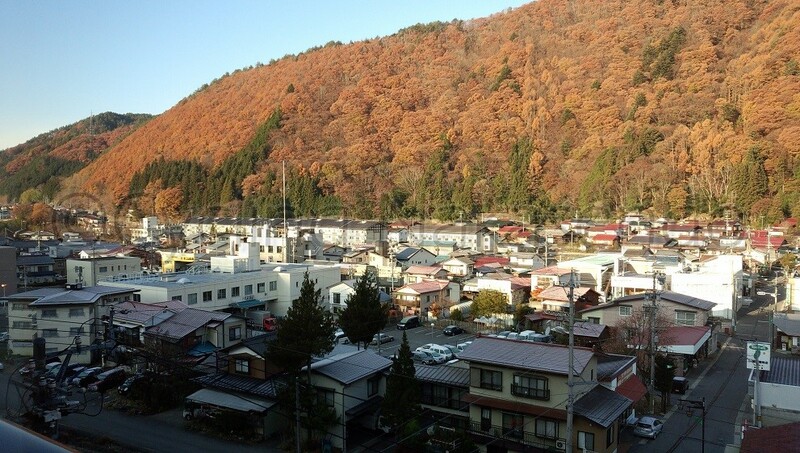 Many travelers stayed in Fukushima overnight in order to prepare for this sekisho, which resulted in growth of this post town despite its position in an uninhabitable valley.